I have been a HAM since March 1993 and greatly enjoy the hobby. I like going to "hamfests", taking part in radio club events and ARES. 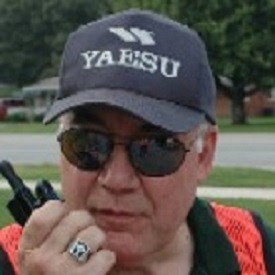 Over the years I have been active in the Mid-State Amateur Radio Club here in Johnson County Indiana and also the Johnson County ARES EC. When I travel anywhere I usually take along an HT and check out the local repeaters. This is a great hobby and it is always handy when the weather turns bad and a SkyWarn net is called up. After being a No-Code Tech for over 20 years I finally up graded to the General Class license on July 20th, 2015. I like meeting and talking to other HAMS. I am active on 2M and really enjoy 6M SSB especially when there is a good band opening. With in the last few years I have found CW to be a fun addition to the hobby. I enjoy QRP and making those small low power radio kits. I have been taking my QRP station with me when traveling and can be found on 7.030 or 7.040 in the evenings. I am surprized how many miles I can communicate on QRP CW on just 1 1/2 watts or less. Lately I have been using UHF DMR radio and like it very much. The audio is very clear and you can talk world wide with just an HT. I like to use a DMR HT when showing someone amateur radio, they are usually impressed on how good it works. HAM radio is one of the best hobbies in the world and recommend it to anyone that has a desire to learn more about radio technology.